To see the entire list use the above link. 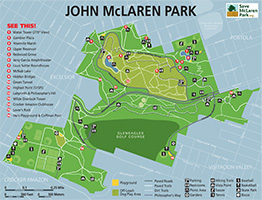 We’re showing the section that lists McLaren Park! For some, even Sutro Tower is too played out. Enter the Excelsior water tower, the real landmark of locals. Officially called La Grande Tank, this Tiffany-blue water tower can be found atop McLaren Park and is one of the first things folks see as they enter the city on Interstate 280. This entry was posted in Park Info on July 17, 2018 by sflindad. Late Summer is here and it’s time for some entertainment in the Amphitheatre! Visit our events calendar for the complete fall lineup. 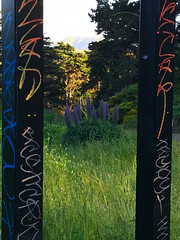 This entry was posted in Events and tagged concerts, entertainment, free concerts, jerry garcia amphitheater, music on July 17, 2018 by sflindad. Come enjoy pizza and your favorite beverage at Saturday in the Park McLaren’s fundraiser 6PM on Friday September 16th in the “Old Peculiars” Clubhouse at the Gleneagles Golf Course. The Fundraiser will feature live music, raffle prizes and a chance to see and honor the work of the pre-apprentice program working to improve the grounds at Gleneagles. Come and enjoy time with your friends and support both Saturday in the Park and Gleneagles at this fun Friday evening at Gleneagles Golf Course located at 2100 Sunnydale Ave, San Francisco, CA 94134. This entry was posted in Events and tagged Friends of the AMP, Fundraiser, Gleneagles, Saturday in the Park McLaren on August 30, 2016 by sflindad. Join us at Laughing Monk Brewery to support Saturday in the Park McLaren, a great free concert series. Laughing Monk Brewery will be donating $1 from each glass of beer we sell from 4-8pm. This entry was posted in Events and tagged entertainment, Friends of the AMP, Fundraiser on August 30, 2016 by sflindad. 2013 – Mansell Corridor Project receives $1.7M in One Bay Area Grant (OBAG) funding, bringing a total of $5.1M in transportation funds for the project. 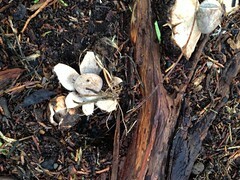 This entry was posted in History, Park Info and tagged History on August 30, 2016 by sflindad. Coming back for their 4th year of successful free afternoon concerts, Friends of the AMP (Jerry Garcia Amphitheater in McLaren Park) announces 6 FREE outdoor concerts dates for the 2016 Saturday in the Park – McLaren music festival. The Festival’s 6 shows run from August 20th to October 22nd and, as in past years, offer music appealing to all ages and musical tastes, from salsa to blue bluegrass, rock, soul and more. 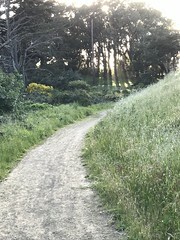 The outdoor concerts also welcome back locals and fans of the bands, and introduce new concertgoers to San Francisco’s 2nd largest and natural park, the 318-acre John McLaren Park. August 20 – Percussionist Louie Romero y Mazacote kicks the Festival in gear at the first show with dancer-friendly blends of Salsa, Cha-Cha, Timba, Cuban Guajira and Puerto Rican Bomba. Added to the lineup is Alfonso Lopez performing songs encompassing many different styles of music from around the globe. August 27 – a great R&B review called: Acoustic Soul Fest- Vol. 2 celebrates the brilliant Soul Culture of the Bay Area, featuring San Francisco native and McLaren Park neighborhood resident, Martin Luther McCoy. September 10 – The 4th Annual Kid’s’ Festival – Featuring The Not-Its, JAM with Charity Kahn, Tree Frog Treks, The Exploratorium, plus magic shows and nature programs, There will be 4 Hours (11am- 3pm) of art, music, magic, science, hikes and dance and much more. Fun for the whole family to enjoy. October 8 – Let the Good Times Rock’n Roll Show! Four virtuoso bands of great musicians will take you on a three and a half hour ride of dance and sing-along music when we welcome Cocker Power –A Joe Cocker Tribute Band, guitarist Lindsey Boullt, Pucci and the Pups band and Big Rain– a Rockin’ Country and Blues group. October 15 – In mid-October we welcome back, by popular demand, a non-stop three hours of new and traditional tunes sung and played by several of our local troubadours at The Bluegrass Festival. The Bluegrass Festival is a non-stop afternoon of new and traditional tunes sung and played by The Back Porch Band, The Beauty Operators String Band, Canyon Johnson and The Windy Hill Bluegrass Band. October 22 – The Blues Show – our season finale concert once again offers a great lineup of local bay area blues performers, including the dynamic Tia Carroll and Bobbie “Spider” Webb. This final show also celebrates the 45th anniversary of the Amphitheater with the annual Saturday in the Park Amphitheater Birthday Party. This entry was posted in Events on August 19, 2016 by sflindad.